If the public hotspots are explained in their terms and conditions are you not opting in by buying their service? Use BT with a different router that doesn't feature a public hotspot? _We have received your request to be informed about the hotspot location in the maps. As a BT customer you must accept the BT's T&C and Privacy police were should reflect the usage of the personal data provided by the customer to BT at the time of registration. The personal data provided to BT has a purpose and the responsible for these personal data is "BT" that should clarify that purpose as is not Fon who collect these personal data and we do not have access to BT purpose of processing user personal data. 2) That's the solution I have been suggesting as per the TP-Link info I posted ! I think the crucial word in your understanding of the situation is "our" in "our locations"
As far as I can see they're not revealing YOUR location but the location of "A" speedhub. There's no visible link between the ID of the speedhub and the name of the customer which means that personal data is not being revealed. Is it being processed? Well that's very hard to determine without knowledge of BT's internal systems, but for PD to be processed in the provision of BT FON there would need to be a link between the ID of the speedhub and the customer. Even then BT could pseudonymise or fully anonymise the data without any great effort. In fact, it's probably far harder to maintain an accurate list of who has what router than it is to simply ship the next box in the pile and be done with it. How is the location of the speedhubs calculated for the maps I hear you ask? Well it could be simply a list of addresses of customers with speedhubs. There's no need to the customers names to be included in that list. A list of addresses isn't PD unless it's linked to names. (Even a name isn't necessarily PD, especially if it's a common one). It could be phone numbers for which BT are likely to know the locations, but even then a landline isn't going to be personal data. Of course, even if PD is being used to provide the BT FON service (and this is only suspected and not proven) there are still mechanisms that allow BT to lawfully process that PD without consent. Consent is only one lawful basis for processing PD and BT only need demonstrate that one basis applies for their processing to be legal. Clearly Vital Interest and Public Interest aren't going to be relevant but Performance of a Contract could easily be (especially if BT undertake to provide the BT FON service in their contract with you) and Legitimate Interest looks likely to me. For Legitimate Interest they just have to say that what they are doing is legal and doesn't infringe on the data protection rights of the subject (and for infringement to apply PD would have to be processed unlawfully during that operation). So, I'm pretty sure that you won't be able to get BT to change their TnC on any legal basis. Of course if you raise enough public awareness you might get them to concede something - maybe a more public set of controls over BT FON on speedhubs - on a Public Relations basis. Just had a thought. If BT wanted to automate the mapping procedure AND make it GDPR tight they'd just use a BT FON app on the mobile device to connect to BT Fon networks. If this reported hotspot locations back to the BT HQ using all the great data you can get from a phone (GPS, WiFi signal strenght, Connection Speed) then their process would not only be easy and automated but it would be trivial to demonstrate that speedhub locations were nothing to do with Personal Data. I've never used BT FON but that's how I'd design it if I was King of the World. Sorry for the delay in replying Morat but I still have not received a response form BT (of course): Not sure if that is because they are ‘concerned’ by my questions (and so are checking with their lawyers, which I very much doubt) or simply don’t care ! -Find you own location and ‘zoom in’. You will note FON have made it more difficult to locate individual HotSpots……. ie. "You can't get around privacy rules just by using a Third Party" ! If, as I do, you live in a remote area and are the only house for at least 750m, then any hotspot is pretty specifically identifying an individual property. All true, but a property address is not personal data. Judge: Addresses are not personal data. On what grounds do you think you have a case against BT? You: There have been groups of kids hanging around my remote house to use the hotspot, they may not have known about the hotspot if BT hadn't published the info. Judge: Our expert witness here says you could easily prevent the kids gathering by using a different inexpensive router, while this court case will cost £X. I like your scenario there Lpgc - especially when the (BT) Expert Witness states "it's OK as long as you take the BT Router out" ! But your case has a hole big enough to drive every Land Rover product ever made side by side through it. An address is not personal information. It does not allow anyone to identify the identity of the person that lives there (unless the householder has put a bloody great sign outside saying, Fred Bloggs lives here). If it did, the likes of Zoopla, Rightmove and every estate agent in the country would be in contravention of GDPR. What actually would exercise me, if I didn't live in the middle of nowhere, is more the fact that MY internet service which I pay for under contract with BT, could be used by any third party FOC, and presumably slow down my available service speed. Given that our house is not a hotspot and I'm pretty sure I didn't choose to opt out of FON, not sure how this comes about? The FON service is capped at 1Mbs and isn't enabled if you have a slow connection in the first place (which you may have if you are really out in the sticks) so it doesn't slow down a customers connection. You are paying BT for a service and by opting into (knowingly or otherwise) the FON service, you can use every other BT customers connection. So you still getting service even when out of range of your own router. …. And it’s not actually my case it’s the GDPR’s Case !! Accordingly if, as with my affected neighbour, BT have publically published data which caused his life to be impinged on, then that alone can be an infraction ..
And it’s not just BT’s (usual) bombastic stance that is driving me now, it is the notion that there may well be many others like my poorly Neighbour being (badly) affected…. Anyway…. 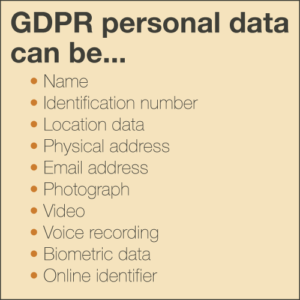 thanks to everyone for their comments/banter etc; It has encouraged me to research/pursue this further and I will now definitely escalate this with the ICO (and report back): BT will probably continue to ignore me but they can’t really do that to them..
What is GDPR Personal Data? In Article 4(1), GDPR specifically states that “personal data” means any information relating to an identified or identifiable natural person, which is someone who can be directly or indirectly identified. For further clarification, the law provides examples of personal data: a name, identification number, location data, physical address, email address, IP address, radio frequency identification tag, photograph, video, voice recording, biometric data (eye retina, fingerprint, etc. ), or an online identifier of one or more factors specific to the physical, physiological, genetic, mental, economic, cultural, or social identity of a natural person. I don't work for BT, but I am qualified in Data Protection law. You need to look at your posts and strip them back to only the points that can be argued from the GDPR/DPA 2018. I'm sorry, this was fun but now I'm bowing out. If you want to take BT to court it's your choice. My final piece of free legal advice is that you should think very carefully before entering into a short but expensive campaign against a company with limitless resources. Especially when you're wrong.
" From your Fitzpatrick link I see nothing that supports your theory and nothing that contradicts mine " Really ? You are trained in Law for sure ! We all know what BT will do (and that should not be allowed either); "We changed our Ts&Cs and then posted them up on our web site, didn't you see them ? (and similar platitudes) "
In fact I have taken on the Big Boys a couple of times in my own career and so don't actually need any free legal advice; Don't take it personally but _not _doing something about this is how they (continue to) get away with it, and is exactly why the GDPR were introduced in the first case and the same principles will be deliberated on for some time too ! Indeed, based on how badly it affected my neighbour enduring chemo I believe I should have done something about it sooner: Thanks to some of your remarks (banter or not) I now have; Will I 'win' ? Who knows ?!... but surely that's not the point.... ? Sign up for BT Broadband and get free access to over 5m hotspots across the UK! +5 Million Wi-fi Hotspots. 18 Month Contracts. Unlimited Broadband. Types: Broadband, Fibre Optic, Unlimited, BT Plus. I wonder if BT would argue that one of the reasons people sign up is to enable themselves to use hotspots and they need to know where hotspots are to use them. By signing up you knew you'd be able to use listed hotspots but also knew your address would become a listed hotspot... Isn't it fairly obvious that by default with such a service your address would be a hotspot and listed? If you never liked the way that works you could have gone with a a different ISP.. You could still switch to a different ISP, why are we in court when plenty other customers appreciate the trade-off. But your address is useless on its own if I don't know that you live there. It won't necessary personally identify you as being someone that lives there by itself. Equally your name is useless on its own - Bob Smith isn't unique to person X. There might be a person Y and Z too also called Bob Smith. Version X of Bob Smith and Address A however, could be personal data if Bob Smith X lives at Address A. Together, that's unique personal data that identifies Bob. But good luck with it. I'd just not use BT or turn it off if you're that bothered. First a quick reminder chaps that I did not write BTs WiFi Contracts and/or the GDPR ! We're not in Court, that was your suggestion/scenario ! I have turned it off; And at least many neighbours appreciate/understand a quieter neighbourhood now ! They also indicated that if you OPT OUT of their WiFi it then takes 7-28 days for your Hub to stop being a HotSpot ! !